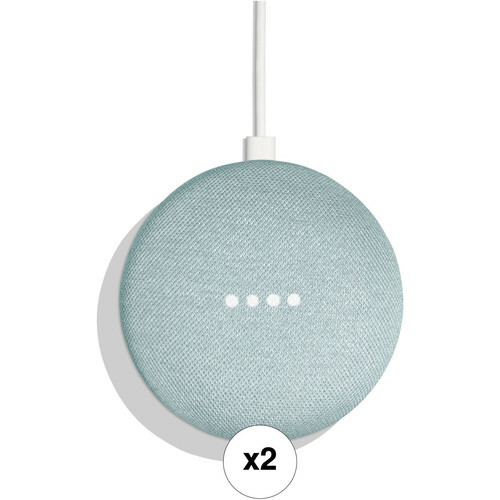 Create a new two-room Google ecosystem, or expand your current one, with this B&H Kit of two aqua Google Home Minis. Simply plug them in, connect them to your Wi-Fi network, and they'll provide control of, and access to, virtually all of your smart devices. They can play music, check the weather and traffic, tell you sports scores, control your compatible smart home equipment, and more. Using far-field voice recognition technology and the Google Assistant, the built-in microphone allows each Google Home Mini to recognize your voice and perform the requested task in an instant. They can distinguish up to six different voices to provide control for the whole family. You can stream music to the Home Mini from your compatible smart device via Wi-Fi. At only approximately 3.86" wide and 1.65" tall, each Google Home Mini is designed to fit nearly anywhere in most décors. With integrated Wi-Fi connectivity, voice recognition, and home automation support, the aqua Google Home Mini wireless speaker will connect to your wireless network to provide control of, and access to, virtually all of your smart devices. It can play music, check the weather and traffic, tell you sports scores, control your compatible smart home equipment, and more. Using far-field voice recognition technology and the Google Assistant, the built-in microphone allows the Google Home Mini to recognize your voice and perform the requested task in an instant. It can distinguish up to six different voices to provide control for the whole family. You can stream music to the Home Mini from your compatible smart device via Wi-Fi. At only approximately 3.86" wide and 1.65" tall, the Google Home Mini is designed to fit nearly anywhere in most décors. Note: Services offered subject to change; please see the manufacturer's website for a list of services currently offered. Initial setup requires a compatible mobile device running the Google Home app; the Home Mini cannot be setup with a Windows or Mac device. Syncing services, such as backup, require a Google account. Content acquired via certain apps may require subscription to a service. Get hands-free help in any room with the Google Home Mini, powered by the Google Assistant. You can ask it questions and tell it to do things. Use your voice to find information about the weather, news, sports, and more. Get help with things like your schedule, commute, travel information, and more. Control your favorite music, movies, and shows, using only your voice. The Google Assistant allows you to use your voice to control your compatible lights, thermostats, and more. Get personalized responses for everyone at home with voice recognition for up to six different voices. Box Dimensions (LxWxH) 4.8 x 4.8 x 4.0"